Yet another way to “play” with the Periodic Table and become even more familiar with it! Use a pattern inside the pillowcase so you don’t have to draw the boxes from scratch. You don’t have to worry about getting your lines straight. 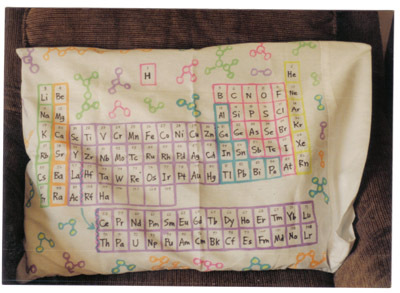 Use fabric markers to color the families on the table, and fill in the symbol and atomic number for each element. You can even put glow-in-the-dark fabric paint on the radioactive elements! This project is best done in at least two sessions. Very few kids will have the patience to complete it all at once. Allow 30-60 minutes per session, depending on how fast your students work. Light-colored pillowcases (light enough for the black lines of the pattern to show through), fabric markers, pins to hold the pattern in place, and possibly an iron if your markers call for heat to set the dyes.